Just a short reminder for those of you who may have forgotten/not seen the original announcement. 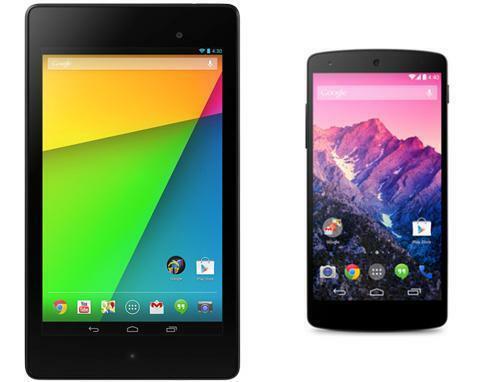 Both the Nexus 7 tablet and Nexus 5 are available to buy from T-Mobile retail stores from today. The tablet was previously only available for pre-order online, shipping today. The Nexus 5 was available to order online only from November 14th. In terms of pricing, the Nexus 5 is available for $41.99 down with 24 monthly payments of $17 on EIP. Nexus 7 is available for $0 down and 24 monthly payments of $16. Google’s tablet will also fetch any buyer 200MB free data each month. As per the new tablet deals, new customers will also need to sign up to some form of plan, existing customers can take an EIP on the Nexus 7 without signing up to any additional plans. Let us know if you picked either device up from your local store today. If so, what are your first impressions? Great devices, or so-so? i was so considered on going to tmobile store and get the nexus 5 but also remembered that i just paid off my phone so my monthly payment every month would only be 73 dollars. but 42 dollars down and 17 dollars a month isnt so bad but too bad they dont have white only black. Just got mine today :) they saved me one it sold out they had 10 units also they charged mine up :) yeahhhh boy. Hopefully one of my local stores will have it in on Friday. I haven’t called any to check on stock right now because it can easily change in two days. Blah Blah Blah, So what? No one wants a Windows phone. blah blah blah , so what? not everybody wants Android. i agree with you on that, is one of the main reasons why i don’t get the Nexus 5, the nexus experience is great but my own experience with the Nexus 4 was frustrating to an extend, i could only wish Google make a Moto Nexus given the fact they own Motorola and their droid line up is amazing, so why not Moto? they could have based the Nexus 5 off the Droid Maxx but oh well. My battery life has been fine. It’s currently at 26% after 13 hrs on battery. Moderate usage. Love the N5. I’m in the same boat. I will be waiting for the S5. Sold my S4, rocking an old S2, got the cash in hand for April/May. The S5 rumors sound redic. The S4 IMO wasn’t a worthy upgrade to the Note 2 I had, I don’t even think it was a worthy upgrade from the S3. The last phone that seemed like a HUGE Sammy upgrade was going from the S (Vibrant or 4G) to the S2. My Nexus 4 is still going strong. I would not have tried another LG phone, though. Ordered one from my Business Rep. Should arrive tomorrow. Picked one up from my local corp. store today. They had plenty in stock, along with all the accessories. Switching from G2, N5 is an awesome phone. Glad T-Mobile is selling it on EIP, saves me some money short-term and allows for extra cash that I can spend on holiday shopping. Yep, got the Nexus 5 yesterday. I have been addicted to researching for my new phone for 2+ months now. I can’t say I’m 100% satisfied. Here are some things nobody has mentioned. First off, the black levels on the display are pretty weak. Secondly, the sharp corners of the frame are not comfortable. I don’t know why they wouldn’t have rounded or at least softened the edges. I also had a real hard time getting connected to my pc for file transfers. MTP didn’t work at all and PTP wouldn’t let me move files to the root folder. Very few have discussed how terrible the speaker is. You can hear a bit of tinny vibration and the speaker lacks the volume one would want for speaker phone calls. And the last thing I have to complain about is the crappy volume and power buttons. The buttons jiggle around so much I can hear them jangling around when I tap the display. How come nobody has mentioned that yet? I really feel your are dissatisfied with your recent purchase, I think you should return it and buy an iphone 5s. I’ve seen these concerns on Android Central. Well what do you expect, the best phone ever built at the cheapest price? SMH! The phone is also made by LG…..nuff said! Pretty crappy of them to offer the Nexsus 7 in Store before the preorder customers even get theirs shipped to them! That’s pretty low! So I can buy a 16 GB Nexus 5 from T-Mobile for $449.99 or a 32 GB Nexus 5 from Google for $399.99. Am I missing something here? Or you can pay $40 right now instead of $350 right now. How hard is it for people to understand that? Exactly. It’s basically a short term fix for some people that can’t exactly fork over $350 all at once. I do think it’s a better idea to save up and buy the phone through Google… But that’s just me. This is why some people can’t afford a $350 up front to start with. Wasted $150 (or 43% over cost at Google.) because they have to have the latest thing right now, even though they can’t afford it. Some people are willing to pay more for “0% financing”. I’m the idiot? You are for paying 29% more for your phone than I did. Hell even if you didn’t have the money up front and used a credit card to buy it from Google direct you wouldn’t pay anywhere near $100 in interest charges in a year and your monthly payment would be less than $17 and it would technically be ZERO DOWN. Don’t call me an idiot, you sir are the idiot! No, you’re still an idiot because you can’t grasp the reason for the extra price tag. Seems it needs to be explained to you in detail or something, you obviously have never studied business. So you’re T-Mobile, you probably pay a little more for the phone than Google does, but you wanna make this part of the eip program, what do you do? Oh I know, charge the same as Google and still offer an easier way for customers to get their hands on the phone by way of a measly $40 down payment. Where are you gonna make your money? THINK! I ain’t getting this phone because personally it’s a cheap phone. You definitely get what you’re paying for. Fact is, if I did get it, I’d pay less than you through T-Mobile, because I’d pay the $40 down payment, and trade it away 4-6 months anyways through the jump program. Now who’s the idiot? Ur’re the idiot… It’s called save yr money fool and wait! But u keep paying T-Mobile the extra $100. Dumb is more like it. And BTW if u think T-Mobile paid extra for the n5 u are really an idiot. Since the n5 is already basically at cost, the only way T-Mobile and sprint would sell it is if they could mark it up. Google is happy cause they want market penetration.